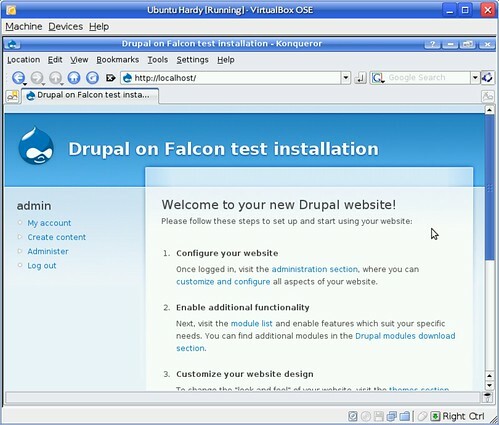 This article describes how to install the Drupal 6.2 CMS on MySQL 6.0, using the Falcon Storage Engine. The operating system is a default Ubuntu 8.04 "Hardy Heron" (x86) installation. I will make a few assumptions here, in order to keep the instructions simple: a fresh OS install, no other MySQL databases or web services are running or have already been installed. Both MySQL and the web server are installed on the same host. You should be able to become root to install packages and to have access to the local file system and the system configuration. This article will explain how to install and configure Apache/PHP, MySQL 6.0 and Drupal 6.2. Continue reading "Running Drupal 6 on MySQL 6 using the Falcon Storage Engine"